The PMBOK Guide, 5th Edition identifies 4 models of stakeholder classification - Power/Interest Grid, Power/Influence Grid, Influence/Impact Grid, and Salience Model. The first three models are quite similar and use 2 attributes to classify project stakeholders. The fourth - Salience Model - uses 3 attributes and adds the vital dimensions of legitimacy and urgency. In this post, we’ll learn about the Salience Model of stakeholder classification. Why is Stakeholder Classification important? The term salience means prominence, or the quality of being particularly noticeable or important. Before we go further, let’s understand why we need to classify the project stakeholders. Large projects may have hundreds or even thousands of stakeholders. Projects have limited time, and resources. Therefore, the amount of effort spent on stakeholder management and engagement needs to be prioritized. But what criteria do we use to classify the stakeholders? How do project managers determine which stakeholders have the biggest impact or influence on the project and deserve the most attention? How do project managers prioritize their attention to competing stakeholders? These are exactly the problems that the stakeholder classification models address. It is important to prioritize the stakeholders to ensure efficient use of effort to communicate and manage their expectations. We have various models that help classify the stakeholders according to the their power, interest, impact, influence, urgency and other parameters. Salience Model is one such model for stakeholder classification. Power - authority and influence in the organization and on the project outcomes. Legitimacy - their involvement is appropriate (morally, legally etc.). Legitimate stakeholders are the ones who “really count”. Urgency - calls for immediate attention, or pressing need. Urgency is based on 2 attributes. The Salience Model was developed by Ronald K. Mitchell, Bradley R. Agle and Donna J. Wood and presented in their paper Toward a Theory of Stakeholder Identification and Salience: Defining the Principle of Who and What Really Counts. Mitchell, Agle and Wood argued that while power is a crucial factor in stakeholder salience, the legitimacy and urgency also play a part. There may be stakeholders who do not have power, but still matter to the organization and the project. Power and Legitimacy combine to create Authority. By adding “urgency” to the mix, the stakeholder relationship moves from being static to dynamic. I suggest you to read the original paper for a thorough understanding for the topic. This post provides of gist of the Salience Model that would help you prepare for answering the question on the PMP exam. The Salience Model is graphically depicted as a Venn Diagram. 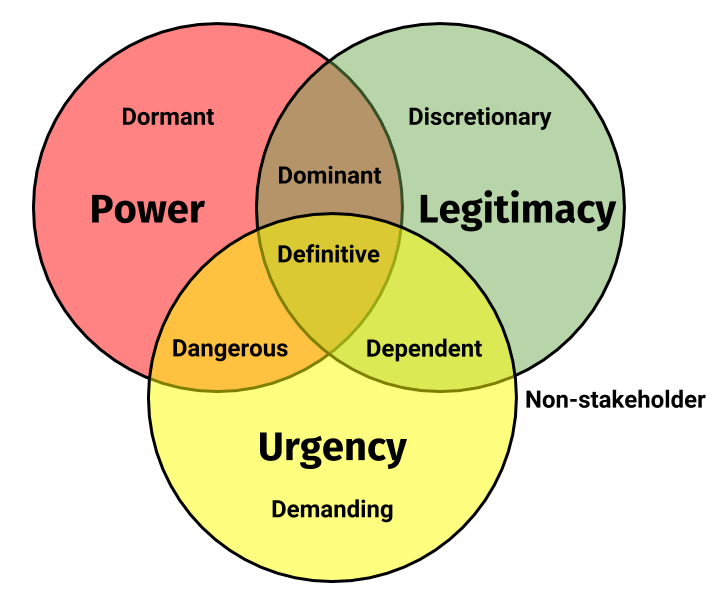 The three circles represent Power, Legitimacy and Urgency. We have 8 regions marked on the diagram each representing different types of stakeholders on the project. Let’s review each of them in detail. As we go through the various types of stakeholders in the Salience Model, we’ll use the example of a manufacturing organizational setting up a large manufacturing plant in a rural community. Latent Stakeholders are those who possess only one of the 3 attributes - Power, Legitimacy, and Urgency. With limited time, energy, and resources for managing stakeholders, project managers may not spend much time in managing latent stakeholders. Likewise, latent stakeholders are not likely to give much attention or acknowledgment to the project. Such stakeholders usually have a “passive” stance to the project. Latent stakeholders can be of 3 types - Dormant, Discretionary, Demanding - depending upon the particular attribute - Power, Legitimacy, and Urgency - that they possess. The stakeholders who only possess power but have no legitimacy or urgency are known as Dormant Stakeholders. Dormant stakeholders do not require active engagement. However, Project Managers need to recognize them because if these stakeholders acquire legitimacy or urgency, they can acquire more prominence (salience) for the project. For example, employees who were laid off from the job could be a dormant stakeholders. But these stakeholder make acquire salience if they file a law suit against the company. The stakeholders who are legitimate but have no power, and their interests are not urgent are considered Discretionary Stakeholders. A stakeholder may be legitimate but unless the stakeholder has power or need urgent attention, they would not receive the attention of the project manager. The charity organizations, schools and hospitals that receive funding from the organization are examples of discretionary stakeholders. They possess no power or urgency to their claims. Demanding stakeholders are those who have urgent demands, but no power or legitimacy. They create “noise” and can be irritants, but are not dangerous to the project as they lack the power and legitimacy (which together equals authority), and unlikely to command much attention. An employee asking for frequent raises outside of organization’s established policies is an example of a demanding stakeholder. Expectant stakeholders are those who possess any 2 of the 3 attributes - Power, Legitimacy, and Urgency. These are stakeholders who are “expecting something” from the project. Such stakeholders usually have an “active” stance to the project, compared to the “passive” stance of dormant stakeholders. These are stakeholders that require active stakeholder engagement on the part of the project manager and the organization. Expectant stakeholders can also be of 3 types - Dominant, Dependent, Dangerous- depending upon the combination of attributes - Power, Legitimacy, and Urgency - that they possess. Dominant stakeholders are those who possess both power and legitimacy, but not urgency. These stakeholder have legitimate stakes in the project and also possess the power to act on those stakes. These are stakeholder that “matter” to the project manager. The project manager needs to actively engage these stakeholders and have a strategy to manage these stakeholders. For example, in case of our large manufacturing plant setup, the local government is a dominant stakeholder in the project. They have the power and legitimacy, but no urgency as such. Dependent stakeholders lack power but have urgent and legitimate stakes in the project. For example, if the manufacturing plant is causing displacement of the local farmers in the area, then those farmers are “dependent” stakeholders in the project. They rely on other “powerful” stakeholders to uphold their interests. In our example, these powerful stakeholders could be non-profit NGOs, or even management of the company who are sensitive to the needs of the displaced farmers and offer them adequate compensation. Though dependent stakeholders lack power, they can form coalitions with other groups of stakeholders and achieve power. Stakeholder who possess power and urgency but do not possess the legitimacy to their claims, are considered dangerous stakeholders. Such stakeholders can be coercive or even violent in some cases. For example, a local mafia or terrorist organization may seek to sabotage the development in the region that the new manufacturing facility may bring. The project team needs to recognize these dangerous stakeholders and the threat they bring, and devise a plan to mitigate the threat posed by these dangerous stakeholders to the project. Stakeholders who possess power and legitimacy, and have an urgent need are known as definitive stakeholders. They demand the utmost attention from the project manager and need to be attended to in a timely manner. For example, the stockholders of the organization who are powerful and legitimate feel that the new manufacturing plant is going to adversely effect the stock prices (urgency), they may oppose the project. According to this model, entities with no power, legitimacy, or urgency in relation to the project are not stakeholders and will be perceived as having no salience by the project team. Latent stakeholders may become Expectant or Definitive stakeholders, and Expectant stakeholders may become Definitive stakeholders by acquiring the missing attribute. For example, let’s say a powerful opposition party, which is favorable to the interests of the farmers, comes into power by winning the elections. It puts the construction of the manufacturing plant on hold. Before the elections the party may have had power and urgency but lacked legitimacy. But they acquired the missing attribute - legitimacy - by winning the election. Project teams need to actively look out for such transitions of stakeholders from one class to another. Applying the 4 stakeholder management strategies used in the Power/Interest Grid model to the Salience Model, following is the interpretation that I made. Note that this is not a part of the Salience Model. Classifying stakeholders is a subjective process. One project manager may perceive a stakeholder as “dangerous”, while another may view the same stakeholder as just “demanding”. The project manager’s attitude toward the stakeholders may differ based on his/her culture and values. The model considers the 3 attributes as either “present” or “absent”. But in reality, these attributes may be present to various levels (operate on a continuum). For example, in this model, the stakeholders are treated as either possessing power or not possessing power. But in reality, the stakeholders may possess various levels of power. This model does not help the project manager do comparison of one stakeholder with another based on a particular attribute. For example, is one stakeholder more powerful than another? The Salience Model doesn’t address this. The model is based on 3 attributes - power, legitimacy, and urgency. However, there may be other attributes too that influence stakeholder relationships. Salience Model helps to identify “Who or What Really Counts”. The model emphasizes the need to pay attention to stakeholders in a timely manner. The Salience Model has advantages over the 2-dimensional grid models such as the Power/Interest Grid, as it adds the vital dimensions of legitimacy and urgency. It provides the project managers a systematic approach to managing stakeholder relationships. Before I close, did you notice that the Salience Model uses mnemonics to promote recall? All 7 classification names begin with a ‘D’! Hope you found this post useful. If I’ve missed something, please feel free to add using the comments section below. There’s no option to download the content of the blog, but you can print the posts using the browser print function for your personal educational use (not for reproduction). You have described everything very simple and is very engaging. Stakeholders can be classified based on their power – interest, power – influence, influence – impact, and power – urgency – legitimacy. Among all, the power – interest classification is the most widely used to classify stakeholders. Thanks for your contribution, John. Hi Harwinder, thanks for the article. Good summary and explanation of the original paper. I was wondering if you could comment on how to choose between one of the matrixes or the salience model when doing a stakeholder analysis for an organisation/project. In which case would you use salience vs e.g. a power/interest grid? Are there any typical attributes an organisation could have that would lead you to use the salience model and not a grid, or vice versa? Or would it rather just be the preference of the person/team doing the analysis?